There’s something about September that makes us crave cinnamon and these gluten free cinnamon rolls are the perfect answer. Using Glutino’s Gluten Free Pantry French Bread and Pizza Crust mix as a base, they are fluffy, soft, and relatively simple to make. Geoff and I always make a half batch of these with the dough left over on our gf pizza nights – recipe for pizza found here. We use half of the dough mix for a pizza and half for cinnamon buns! Lightly grease a 9 x 13 pan or muffin tin. In mixer bowl, fold the ingredients for the dough together and then beat on medium speed for two minutes. Remove bowl and cover lightly with plastic wrap. Let rise in warm place for 40 minutes. After 40 minutes, remove dough from bowl and heat oven to 350 degrees. Divide dough in half and place each half on its own sheet of parchment paper. With a metal spatula or icing spreader, spread each half of the dough into a rectangle that is approximately 12 x 15 inches. TIP: You can also use a rolling pin to roll out the dough but place a piece of lightly greased parchment on top of the dough to keep it from sticking to the rolling pin. TIP: If you need to, tuck a corner of the parchment paper between your hip and the counter to hold the paper still while you spread the dough. Brush each rectangle with the melted butter, leaving a half inch of unbuttered dough around the edges. In a small bowl, mix together the brown sugar, cinnamon, allspice and nutmeg. Divide mixture in two and spread on each rectangle of dough – again leaving the outer half inch clean. Sprinkle each rectangle with ¼ cup of raisins. Lightly press the raisins and cinnamon mixture into the dough. Now, take one rectangle and position it on the counter with the long edge parallel to the counter’s edge. Using the parchment for support, slowly begin to roll the dough onto itself, peeling the dough away from the parchment as you go. When you are finished, you should have a 15 inch long “jelly roll.” Repeat with the other rectangle. With a sharp knife, cut the “jelly rolls” into two to three inch slices to make your individual buns. Place each 2 inch section cut side down in your greased cake pan or muffin tin. The two outer slices on each roll will be a bit ragged. You could trim and discard the outer edges, but we bake them up anyway – they taste just as good as the rest! TIP: Moving them from the parchment to the pan is surprisingly difficult to do. The dough wants to stick to your fingers or to your spatula. We find greasing our fingers helps. Please let us know if you come up with a better way! TIP: These buns can tend to be a bit dry the next day. Plump leftovers in the oven before serving to moisten by wrapping them in tinfoil and placing them in a 350 degree oven for 5 to 10 minutes. 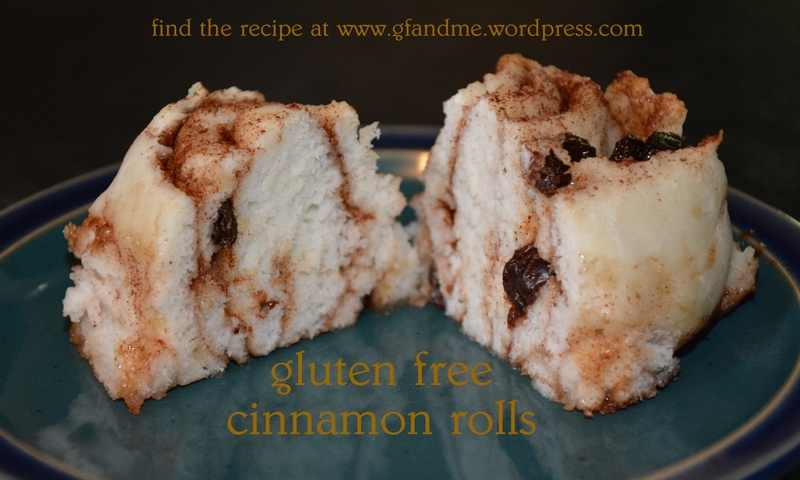 This entry was posted in Baking, Breakfast & Brunch, Drinks & Desserts, Recipes and tagged celiac, cinnamon bun, cinnamon roll, cinnamon roll with cream cheese icing, GF, gluten free, gluten free in Red Deer, glutino french bread and pizza mix recipes, recipe. Bookmark the permalink. Thanks for checking out my new blog! I look forward to following your blog! Your GF recipes look fantastic! Can’t wait to try some! Have a wonderful weekend!! This looks wonderful, I have to make this!!!!!!!!!!! Thanks! The bread mix really does cut down on the work. Ah! Thanks for the tip about using the oven as the “warm place” for the dough to rise. I never thought of that. You’re welcome. It works really well. OMG STOP this looks YUMAZING! Thanks! Yes, it would do the trick. We’ve even just made “cupcake” style buns in a muffin pan and topped them with cinnamon and brown sugar. Not as pretty, but a lot easier!